How many times you hit the snooze button before getting up eventually? Or do you look like a zombie when you wake up in the morning? If yes is your answer, perhaps you will want to check out Sleep Cycle Alarm Clock app for iPhone. It helps you wake up in the most natural way you’re supposed to. You can get Sleep Cycle Alarm Clock app for $0.99 from iTunes App Store. Sleep Cycle Alarm Clock app for iPhone is an intelligent alarm clock that analyzes your sleep and wakes you in the lightest sleep phase – the natural way to wake up feeling rested and relaxed. This app assumes relevance if you end up pressing the snooze button many times every day before you eventually get out of the bed. Doing so disturbs your sleep cycle, which is not so good a practice at all. 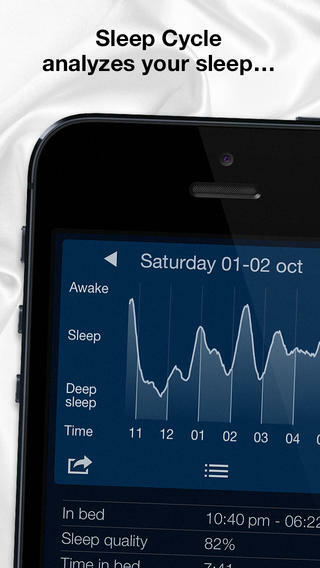 Sleep Cycle Alarm Clock app for iPhone, in a sense, is an all-in-one alarm clock. It detects your sleep patterns aside from being an alarm clock. The app uses your iPhone’s accelerometer to detect your movement and determine which sleep phase you are in. All you got to do is to keep your iPhone next to you and let it track your sleep habits. The app then finds the optimal time to wake you up during a 30 minute window that ends at your set alarm time. In other words, Sleep Cycle Alarm Clock app monitors your movement and determines which sleep phase you are in, and wakes you when you are in your lightest sleep phase. In this phase, you’ll wakeup relaxed and peaceful. Of course, you can pick the alarm tone you like. Also, you can view detailed sleep statistics and graphs to understand your sleep patterns. You can export your sleep statistics to Excel. There is also an option to add sleep notes. Sleep Cycle Alarm Clock app is compatible with iOS versions 5.0 or later. Sleep Cycle Alarm Clock app for iPhone makes your waking up every morning a much more smoother and comfortable experience. No longer you’re startled out of your sleep by a blaring alarm. Instead, the app wakes you up when you’re ready to leave the bed. How precisely the app manages to do that is where its USP lies. Verdict: It certainly makes waking up a lot easy. Check it out.